While I've only played the Dungeon Crawl Classics RPG once, I keep hoping to find time to try it out someday. One of the reason is the method that wizards and clerics cast spells: by rolling on a chart for each spell. It's inspired me to develop a more general chart for other DnD/OSR games. 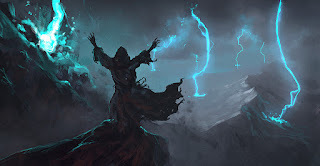 On a roll of 1, the spell fails and the spell slot is lost, additionally the caster gains a cumulative -1 to all d20 rolls when making a Saving throw vs Spells. On a roll of 2 through 4, the spell fails and the spell slot is lost. On a roll of 5 through 16, the spell succeeds, but the spell slot is lost. On a roll of 17 through 19, the spell succeeds and the spell slot is not lost. On a roll of 20, the target(s) of the spell have a -3 to their d20 rolls when making a Saving throw for that spell.